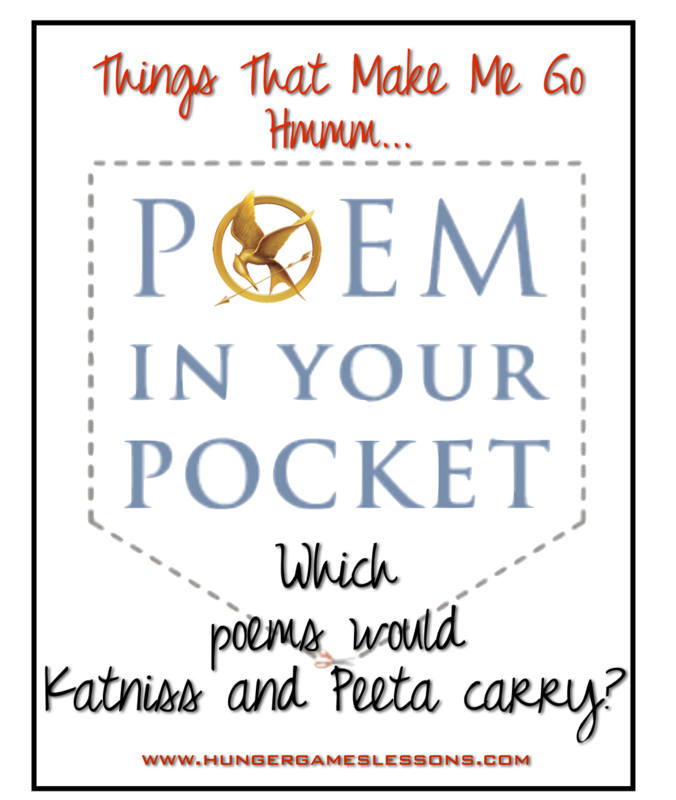 Hunger Games Lessons: Which Poems Would Katniss and Peeta Carry for Poem in Your Pocket Day? 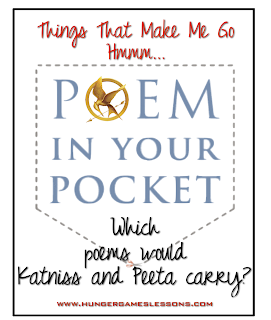 Which Poems Would Katniss and Peeta Carry for Poem in Your Pocket Day? Update: National Poem in Your Pocket Day is April 18th for 2013. This original post was written in 2012. April 26th is National Poem in Your Pocket Day. To celebrate poetry and spread literacy, every one is encouraged to carry their favorite poem with them tomorrow. So, of course, this got me to thinking...which poems would the characters of The Hunger Games carry? To me it fits him (and his feelings for Katniss) perfectly. He would do anything for her and even professes in Catching Fire that his nightmares are about losing her. I think you can look at the line "here is the deepest secret nobody knows" two different ways: that the secret is that the speaker carries the heart in his heart or that the secret is something that keeps them apart. Either translation works for Peeta: his love is a secret until revealed. And there are a number of things throughout the trilogy that keeps them apart, making the second translation of that line work. What do you think about this poem for Peeta? Now on to Katniss...she is much harder to pinpoint. She has such a defensive nature and does not like to express her emotions. She feels bitter toward her mother and misses her father profusely. She's not the sappy type, so I chose a very somber poem titled "Eulogy" by Kevin Young. Why this poem? First, it reminded me of [spoiler alert!] Katniss in her old training room in Mockingjay while her trial is going on. I think she would express these words after she kills herself by starvation. And yet, she fails to allow the darkness to swallow her. She turns inward, just like her mother as we learned in the beginning of The Hunger Games, and the circle has come full. Just as the circle of life closes around us all. I think "Eulogy" is perfect in its seeming simplicity (I love shorter poems that have these hidden layers of complexity). I could imagine Katniss not wanting people to mourn too long over her death. And I thought literally of the lightness of her casket--in her emaciated state. But, there's so much more than literal translation in those lines. Has the weight of the nation been lifted finally? Is that why she wouldn't want them to startle? OK...I know I'm getting too deep here because obviously Mr. Young did not write this about Katniss. But this is what I love about poetry: we can all find connections to these beautiful words. And at different points in our lives, we'll find different meanings, even in our old favorites. Have your students discuss which poems they think the characters would carry in their pocket and why. This can be done for any piece of literature. Why is this a great activity? First, they have to read a lot of poems. Second, they have to be familiar with the literature to make a connection. Third, it allows them to be creative. And fourth, there are no wrong answers. Celebrate Poetry Hunger Games Style! Your Catching Fire and Mockingjay Casting Picks? Sale on Hot Topic Items This Month!